Can one report change the way you view your sales meetings forever? Your sales people are competitive, social, kinesthetic and—dare we say—a little ADD. This is why conventional presenter-after-presenter-after-presenter meetings not only fail to engage the sales force, but are also completely ineffective at conveying information. 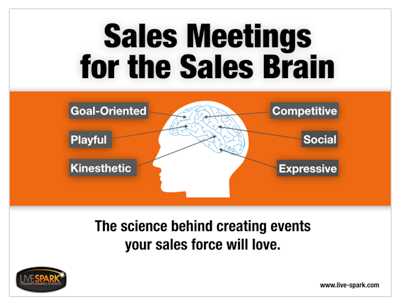 When an event is designed with the sales brain in mind--how they learn, how they interact with information and their peers—your sales force will become fully engaged, active learners with a vested interest in your event. In this free report, you will discover how to design an event that will appeal to the sales mind and see tried-and-true techniques that have helped some of the largest sales organizations revolutionize their own meetings. Written by experts with over 20 years of experience, this report will change the way you view sales events forever.